Discussion in '2015+ Alienware 13 / 15 / 17' started by Ultra Male, Mar 6, 2019. Below are the driver links and their recommended installation order. Before running any of the files you downloaded, make sure you read this: "Are you sure you want to run this file?" [Yes or No] otherwise all the files within the driver whether you run it or extract it will have a BLOCKED status leading to incomplete erroneous installs. Note: When asked to reboot, for the love of God you have a super fast system, follow the instructions and reboot it would only take a few seconds. do not take any shortcuts, I personally reboot after every driver installation whether or not I was asked to reboot by the driver and/or Windows itself. This tool will help you uninstall all Killer Performance Suite services/file and registry remnants. 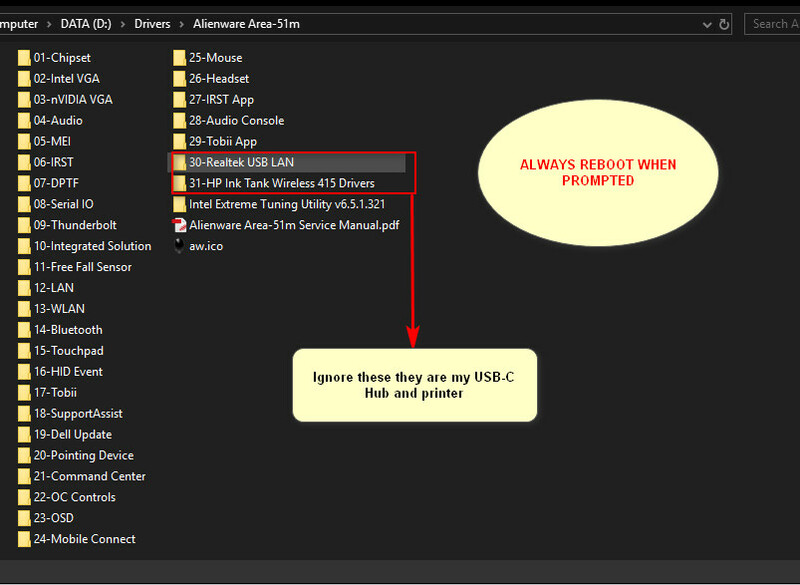 1) Uninstall the Killer Performance Suite (AKA Killer Software) from Control Panel > Programs & Features then reboot when prompted. SpentaTONofMoolah4k, VoodooChild, DrewN and 13 others like this. Sherif_k, Vasudev, ssj92 and 2 others like this. Kormi, Sherif_k, Vasudev and 3 others like this. steberg, Sherif_k, Vasudev and 1 other person like this. Just for clarification, these won't be downloaded automatically through windows/support assist/alienware updates? We need to download them manually? You know the Dell support assistent often works as a piece of pure junk and won't work as expected? Always go for manual downloads and install it afterwards yourself. Yeah I really hope that beacuse this one 18 R1, nightmare for 4 years didn't got any love from Mr. Azor. I still remember your previous Dell model. And yees... Always go for manual downloads and install it afterwards yourself (a good advice from Poopy). Alienware firmware updates and drivers are now officially done through Windows update. So its recommended to put WU into Pause mode after OS security updates are done. Don't use Support assist ever for running diagnostics. Dell switched to ePSA for replacing/checking hardware and using error codes from them. I installed it when I got my system and every time I get GPU stress test failed and said to update the app and it had same issue. Uninstalled it and ran FS in loop and played games. I checked the log files because there were lot of leftovers in Program Data\Dell folder and other random alphanumeric folders made by dell and it wrote/dumped "App requested more VRAM for extreme tessellation and caused TDR"
Before nuking the drives, I suggest you copy AW goodies from C:\Windows\oem or system32\dell\oem folder(s) for updated logo. DrewN, Kormi and Rei Fukai like this.